As web designers we’re all getting a bit bored of using the same old web-safe fonts. Do Arial, Verdana and Times New Roman sound familiar to you? Luckily it’s very simple to embed custom fonts in your website these days. There are plenty of different ways to do it including sIFR, Cufon and @font-face but one of the easiest and best ways to do it is using Google Web Fonts. You can search or browse through hundreds of font families until you find the fonts you like. There are some handy search filters that allow you to narrow down your search to Serif or Sans-Serif and you can also define the weight of your font too. Once you’ve found the fonts you like you simply add them to your collection. To make sure that your fonts will suit your website you can actually test them out in different sizes and styles. You can even test drive your fonts in a simple website preview where you’re able to change the weight, sizes, letter spacing and line height of the fonts which really helps in choosing the right fonts for the job. The last thing to do is copy the link code into the head of your website. In doing this you’re basically linking to a special CSS file that sits on the Google server e.g. Now you’re ready to use that particular font family in your CSS file and it will render on your site like any other web safe font would normally e.g. 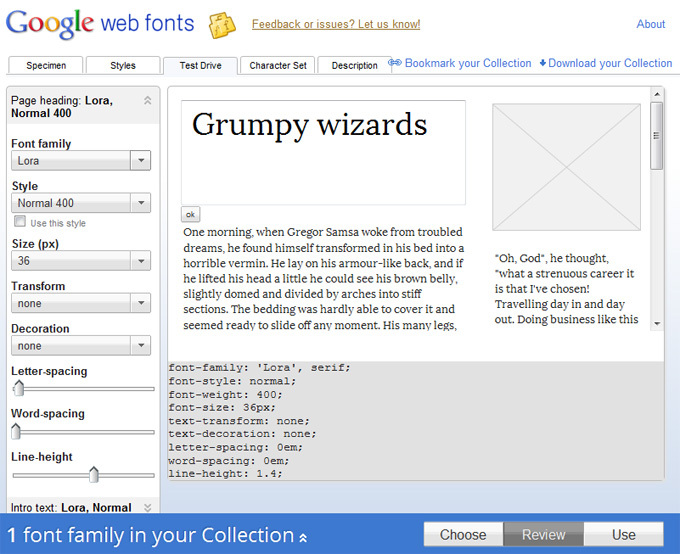 The Google Web Font directory is a great way to embed custom fonts in your website. It’s simple, convenient and light weight. There isn’t a huge variety of fonts at this stage but it’s growing steadily and there should be enough variety for most of your website projects. If you’re looking for another similar solution with more flexibility and variety you could try @font-face.